Based in Geneva, Switzerland, IUCN is the worlds oldest and largest global environmental network. As a globally active organization working with governments, NGO's and United Nations agencies, IUCN is responsible for scientific research and field projects in an effort to find solutions to some of the worlds most pressing environmental issues. IUCN chose Merchant Accounts.ca as their payment processor for the IUCN World Conservation Congress in Barcelona, Spain. The congress is the worlds largest and most important conservation event, held every four years, and attracting 10,000 participants and leading decision makers from the UN, government agencies, the business sector and academia. Any time online payment is required for an event tied to a specific date, timeframes become very important. Because the event was based in Spain, the payment solution had to be implemented to capture payment from each registrant in Euro. The congress is a large event, drawing attendees from around the world. IUCN required a payment solution that could be implemented reasonably quickly, while providing a high degree of customization so that developers could build a web integration that would automate parts of the event registration process, with minimal manual administrative interaction required by IUCN staff. A standard part of the service provided by Merchant Accounts.ca is to assign a dedicated account representative to each customer. This person becomes a central point of contact on all issues. In the case of IUCN, their dedicated account representative was able to advise throughout each stage of the application process, assisting with completion of the application paperwork, and taking the application forward to the underwriters for approval. This is a particularly important aspect of the service because in the merchant industry higher trading volumes typically involve a more detailed application review. In the case of IUCN, their account representative was able to clearly identify the paperwork and supporting documentation that would be required in order to facilitate approval, making it easier for IUCN to complete the process and ensure approval of the account. Once IUCN had established the merchant account, their developers received assistance integrating their website with the payment gateway. Upon completion of integration, and before going live, their dedicated account representative was able to provide a checklist of requirements for account activation, ensuring a smooth process while transitioning from a test environment into a live payment environment for event registration. The result was a smooth and effective implementation of online payment for event registration, with billing to each customers credit card taking place in Euro. 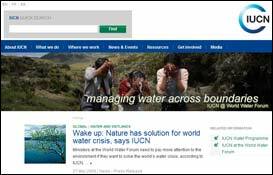 Editors Note - we take great pride in working with IUCN, a fantastic organization contributing towards global environmental responsibility. To find out more about IUCN and their ongoing efforts to combat environmental destruction and work towards a greener, healthier planet visit www.iucn.org.